Ninja compressed air tanks are made in the USA! Ninja tanks are the most user-friendly tank on the market; dissembling with ease and 100% modifiable. They continue to be consistent and reliable each time a new size is offered. The regulator is completely re-buildable by the consumer making it effortless to meet anyone’s specific needs. 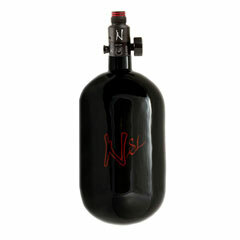 Changing the output pressure can be costly and time consuming but not with the Ninja Tank. It can be easily done by removing a couple shims inside the regulator. -Ultra light weight 2.5 pounds!!! !